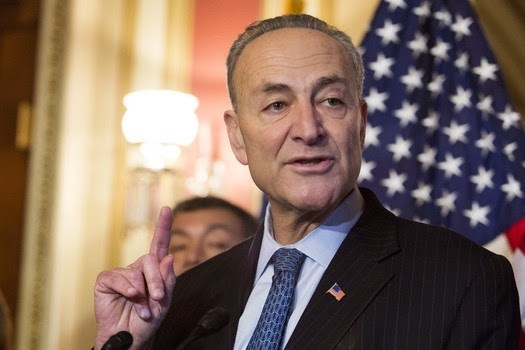 Is US Senator Chuck Schumer (ANTI-NY) even an American? Does he even understand who the Founders were? Has he ever been out of his provincial little hellhole where everybody thinks the peasants shouldn't have guns, but everyone has armed bodyguards? Listen to this statement, regarding a proposed federal Concealed Carry Reciprocity bill. Whether you agree with the legislation or not, listen to how alien this sounds to those of us who live in free states and know so many who carry concealed, and even carry ourselves. This sounds like a linguine-spined surrender-monkey from France or formerly-Great Britain, where everyone is disarmed and enslaved. "...dangerous people from other states to carry concealed weapons in our grocery stores!" Ol' Backwoods should have notified the police, I guess, when I stopped at the gas station in Georgia to take a whiz!? Mrs. Backwoods should have notified the police when she was out shopping in our little town today!? Backwoods Jr. should have notified the police before going to the auto parts store when his truck broke down in Virginia!? By Chucky's lights, we should have notified The Authoritah! when we were all carrying a g-g-g-gun (horrors!) concealed (double horrors!) while visiting these places of business! Miracle of miracles, NOBODY GOT SHOT! How is that possible, Senator Schumer? I mean, hey, when your Noo Yawk City "Only Ones" go after a suspect, 8 or 9 people get shot! And people like Schumer think we are the provincials. You oughta get out more, Chucky. People in the free states carry every single day. We are the safest, lowest-crime segment of society. By and large, we are safer people than the police, I would daresay. The police should notify us that they are carrying!